After you’ve been in a traffic accident here in South Florida, whether you’ve been in a minor fender-bender with property damage to your car or have suffered serious injuries (along with your passengers) in a major car accident, the next step after seeking medical treatment is to file an insurance claim to recover your losses. Dealing with an insurance company after an auto accident is rarely easy and is normally an unpleasant experience. 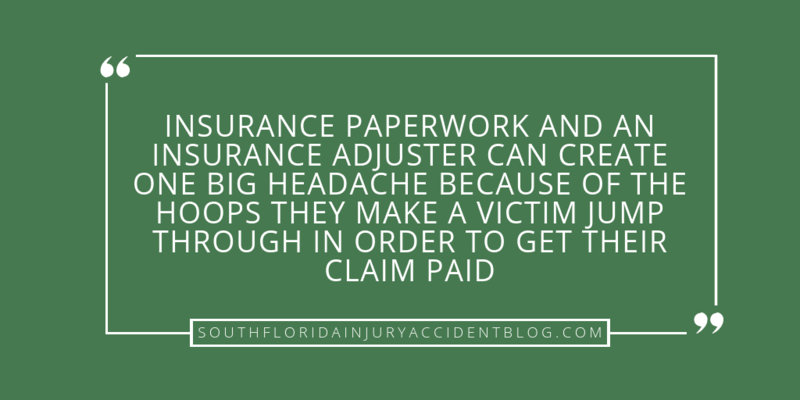 Insurance paperwork and an insurance adjuster can create one big headache because of the hoops they make a victim jump through in order to get their claim paid. These hassles are on top of the frustrations of 1) not having a vehicle to use because it’s either been totaled or it’s in the shop 2) the frustration of not being able to work and make money to pay the bills and 3) having to deal with doctors, taking medication and going to therapy. How Much Money Can I Expect to be Paid For My Insurance Claim After An Accident? For a lot of car accident victims, the big question is not just when will this all be behind me — but, how much can I expect to recover for my car accident claim? The insurance companies all use standardize accident data and statistics so they can churn out settlements without consideration of the individual person and the unique circumstances surrounding their accident. Can A Car Accident Evaluation Form Be Helpful? As a personal injury lawyer, I have represented a large number of car accident victims over the last 34+ years, and I’ve had lots of discussions with insurance adjusters and insurance defense lawyers over what’s the right amount of compensation to pay someone for their car accident claim. To help people figure what what they might expect in settlement of their car crash, we have shared a Sample Car Accident Compensation Form on our web site. In our Car Accident Settlement Form, we not only evaluate compensation for things like how much pay you’ve lost because you haven’t been able to work (”lost wages”), but we also evaluate things like the pain you’ve experienced from your injuries (”pain and suffering”), emotional distress, scarring, and lifestyle needs that you face as a result of the accident (home health care, installation of ramps for wheelchairs or walkers, etc.). A good piece of advice if you have been injured in a car accident is to speak with an experienced lawyer before you file a claim to learn about some of the issues that can arise with these claims, including the type of evidence needed to prove a claim (and include in a demand letter) and the type and amount of damages you can recover. Most personal injury lawyers, like Alan Sackrin, will offer a free initial consultation (over the phone or in person) to evaluate your claim and answer your questions.